I’m now also a radio host! Would you believe? Readers, please note: This report is belated! Returning home to Deep River, CT, and settling in has been long and exhausting! Sorry. And because of technical difficulties, I can’t include for you photos of three of my mentors in this new adventure of mine. I mention two of them below. They are Hal Abrams and Dr. Bob Swain. The third is Joel McMickell. He was a great help also. Joel is the early morning disk jockey with his wonderful show, “Mornin’ Cuppa Joel.” He’s on 16 hours a week. He is also the station’s program director. In his working years, he was an executive in a local supermarket chain. Thank you, Joel! Morro Bay, CA — Yes, think of my astonishment. After 60 years as a writer, I’ve suddenly been dunked into FM radio. Every Saturday afternoon at 1, I’ve been airing my “Gabbing with Old Guy John“ show–my own concoction. Here I am on the air, doing my best to make my “gabbing” interesting and meaningful. I’ve been “the kid” on the station’s talent roster. The studio is right In the Chamber of Commerce building, and that tells you a lot. But it’s not run by the Chamber. And most unusual of all, everyone on The Rock is a volunteer. Yes, unpaid. From the top down. Oh, it calls itself The Rock because there’s a huge old dead volcano right at the entrance of the harbor. You can see it miles out. For sure the station’s founders considered that symbolic. But listening to The Rock, you’d think everybody is a seasoned and polished pro. Well, except me, of course. For sure I’m a novice but getting better, I hope. The station is fighting a big challenge on the financial front of course. Remember, as non-commercial, it has no paid ads and there are many expenses involved. It depends on donations and grants. But it’s making it! I’m told that in the industry it’s creating a buzz–some small, progress-minded communities like Morro Bay see The Rock as a smart thing to launch for themselves. What’s my show about? Simple. It’s an interview show. Every week I have a guest sit down across from me. I select each one with care. In fact, I have a preliminary warm up session. They have to be able to say more than just Yes or No or Maybe. And I pick guests that I’m sure knows a lot about a subject that has substance and will be interesting. I make it a lively encounter. I may have a tough question that I feel I must ask in order to do a good job. I tell them the question. Then they won’t be shocked when I pop it. And they can have an answer ready for it. I feel that’s being fair. I’m still a novice but I haven’t goofed seriously, lucky me. I was plenty uptight the first few times. But calmer now. And I do get light feedback—very few listeners of any station ever phone in gushing with thanks. But what I get to hear does keep me encouraged. Believe me, there’s much more to being a “talent” on The Rock than just chewing the fat with my guest and producing a good show. Leslie Rae is one of my colleagues. She deejays “The Seventh Wave ,”a lively mix of pop music five hours a week. She also hosts “The Community Calendar.” She was a teacher for 27 years—grades 5 through 8. Like everyone else at The Rock, she is a volunteer, doing it for the fun of it and to give back. I’ve learned so much. For instance, I never realized how hard disk jockeys work as their music plays. They have a lot to do…selecting, playing, and preparing their patter, making public service announcements, keeping a log. It was eye-opening. How did this crazy thing ever happen to me? 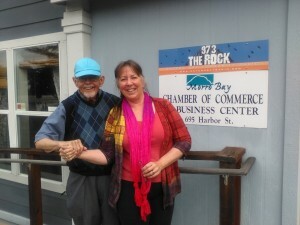 I was a guest twice on Chiropractor Dr. Bob Swain’s show. He calls it “Keeping Healthy.” A good show. The first time was on how I became a vegetarian. And why. In advance I told Dr. Bob to make sure to ask me about the down side. Definitely there is one. And he followed through. I was pleased and so was he. The second time was about my service in Peace Corps in Ukraine when I was hitting age 80 over there. How Peace Corps in its training and guidelines and supervision made sure we stayed healthy in body and mind. Some of that has stuck with me and I did my best to pass it on to our listeners. Thank God I’ve had good mentoring by other talents at The Rock. At times with one standing by and ready in case I flubbed! It would have been good if on dead time I could have sat at the controls and practiced. But there is no dead time. It’s on the air 24/7. So I’ve had to watch and memorize and hope for the best. 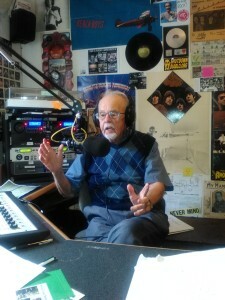 The station streams, meaning sends out its broadcasts in a way that listeners can listen on a computer or smart phone or other digital device. Even thousands of miles away. Truly incredible. So some friends have listened to me even back in my home state of Connecticut. And given me feedback. Which I’ve asked for and welcomed, by the way. So now, I make sure I turn the volume on my mic higher than on my guest’s. I thought about that. “Sure,” I told her, “but I do that for emphasis.” Which is true. However, I’ve been careful to watch myself. One friend even taped my show and let me listen to it. I saw for myself how I could do better. But very soon I’ll hang up my headphones and head back to Connecticut. (Truth is, I’m in Connecticut as I finish this. In small Deep River, my hometown for many years now.) But I’m not quitting The Rock. I’ll be on the mic again when I get back in November. I’ve done a dozen shows. I chose all the topics and all the guests. I’m pleased with the variety in both categories. By the way, I’ve no thought of giving up my writing. I like to think I’m a writer for keeps. –Dave Schwartz, owner of The Bike Shop here: the incredible changes in bicycles and bicycling over the years. — Dr. Bob Swain, who broke me in, as I’ve explained. He did a good job fielding my questions. What chiropractic’s basic beliefs are. How you become a chiropractor—have to put in four tough years earning your doctorate with ongoing training afterward. On and on. — Forrest Ratchford, who was a Peace Corps Volunteer in Romania, fell in love with a young dentist there and married he. Which Peace Corps frowns upon and discourages—“Act in haste and repent at leisure.“ Brought her home to the U.S., and the nearly three years of training she had to go through here to meet our requirements. We gabbed about this on Valentine’s Day. So appropriate. –Harry Farmer, a disk jockey of many years on commercial stations before he started on our station as a volunteer like the rest of us. But my real interest was that he is an astrologer. Yes an astrologer, not an astronomer. Astronomy is a pure science. Astrology is not that. I mentioned that to him. He explained that “astrology is a science and an art.” It was fun delving into that. — Jack McCurdy, a Pulitzer Prize journalist way back at the Los Angeles Times for investigative reporting – now retired after a whole career in journalism in a variety of venues. Interestingly, he is a neighbor of mine in Morro Bay and was a long-time associate of my daughter Monique and her hubby David in a small group of community activists—it took years but they finally toppled the huge power plant that was devastating the salt water environment here. It’s now closed. — Jackie Kinsey, the librarian of the Morro Bay Library. We chatted just before the re-opening of the library after a big and fine renovation. Of course the fervent library lover that I am just had to gab with her about how and why libraries are evolving, and the pro and con of that. — Senior Chief Colin Wadley, commander of the long-time, 28–member Coast Guard Motor Lifeboat Station at the entrance to Morro Bay’s harbor. What those Guardsmen do there. They have greatly amplified responsibilities now. — Myself. Yes, me. A guest had to cancel at the last minute. What to do? ”The show must go on!” It happened to be the 10th anniversary of my solo trip around the world (“Around the World at 75. Alone, Dammit!” I recapped the trip. Both the wonderful moments and the hard moments. — Hal Abrams. I’ve told you about him already. Our founder and president. I wanted our listeners to have a better idea of the enormous effort it took to launch The Rock and put it on the road to success. By the way, I posted a profile of him for you a couple of weeks ago. — Taylor Newton, a young scientist turned social worker: what his non-profit, the Guerilla Gardening Club, is all about—its chief purpose being to rescue young street-wise adults and setting them up for a better future. You may recall that I profiled him in a post recently. — Crystal Nevosh, executive director of Achievement House, which has seven thrift shops in our area. How its main work is helping men and women who are handicapped in various ways, by employing them in its shops, and everything it takes to make that noble work happen. As I look at the list, I see how one-sided it is. Not deliberately, for sure. But next season definitely I’ll have more women on. I look forward to more “gabbing” on The Rock. I’ll let you know when I get started. Maybe you’ll stream one or two of my shows. Remember, I want all the feedback that might make me better. Gosh! I just got great news. Someone is planning to open an FM station in Deep River or next-door Chester. Maybe I can get to gab at that station, too. How about that!